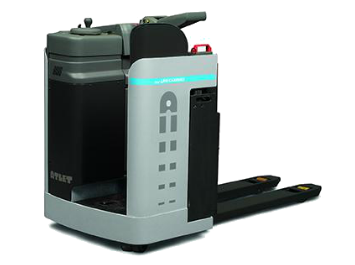 The Atlet Ergo XLL is a heavy duty reliable pallet jack for high traffic and long distance travel operations. With excellent pallet load visibility, your forklift operators can quickly and easily transport palletized goods with the XLL sit-on pallet jack. The Atlet Ergo XLL pallet jack’s advanced ergonomic design include a unique power-assisted mini steering wheel and fully adjustable armrest, seat and floor. This sit-on pallet jack forklift is designed to fit each individual operator; therefore increasing pallet handling productivity. The XLL sit-on pallet jack’s productivity enhancing features include a fully protected chassis and excellent view of pallet loads for safe and precise handling. This Ergo XLL sit-on electric pallet jack is designed for heavy duty warehouse operations. With a wide range of options to choose from, this low lifting pallet jack is suitable for many types of pallets. For multi-shift applications, the battery can be placed on rollers for a quick change. Other features: Atlet Modular Concept design for highest First Time Fix Rate. AC motor for reduced maintenance plus maximum acceleration and drive speed. Atlet Stability Support System S3. ATC truck computer with PIN code access for onboard diagnostics, optimum performance settings and preventing unauthorized use. Click here for further information on Atlet Trucks. This stand-in pallet jack comes with many options allowing it to handle different types of pallets. The Ergo ALL’s forklift driver compartment has well positioned easily accessible controls and power steering. This pallet jack’s unique ergonomic natural standing position and operator fully protected chassis, allow all-round visibility when driving in either direction. For multi-shift applications, the battery is placed on rollers for quick, easy changes. The Atlet Ergo ALL pallet jack ideal for internal pallet transportation in heavy-duty operations with long cycles and high throughput requirements. Other features: Atlet Modular Concept design for highest First Time Fix Rate. AC motor for reduced maintenance plus maximum acceleration and drive speed.